Building your own marketing program takes time and talent. Your team might be large, or small. But they’ll get better results with an expert by their side. Marketing Acuity works with clients large and small to develop strategy, and train clients to manage and produce their own marketing assets. Integrated marketing technology connecting multiple platforms such as e-mail platforms, blogging, web site and databases. Social Media strategy, platform consulting and content training using Facebook, Instagram, Pinterest, and/or Twitter. We help you think through the big communication and technology problems to help your team do more with the myriad of amazing (and in many cases, free) tools available today. We can help you connect: marketing automation, e-mail marketing, blogging and website platforms, member and customer data and CRM systems, event and donor management systems through WordPress, SquareSpace, MailChimp or Constant Contact. We can help your organization get more out of connecting and mastering the systems you have. 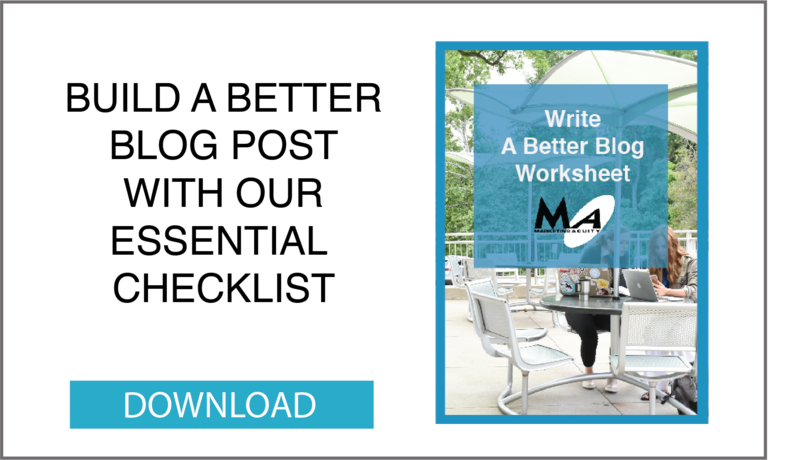 Download our FREE Business Better Blogging Guide that we use as one of the first steps in our training sessions with our clients. It’s a free tool that will help you build a better blog starting with your next blog post.